The cover is fitting for this album. It's emotionally raw. The synth tones are varied and explore different lo-fi qualities. Some tones are expansive and clear, some almost analog sounding, and many are crisp and distant. This also gives it a full and layered sound. The beginning of "The Great Castle's Gate" is a particularly striking moment, a very atmospheric melody and patch to convey that scene, a sense of towering stone grandeur. Care was given to seek out beautiful and classic-sounding dungeon textures. There's not just variation in the tone qualities though. There's many different styles at play, ancient and mysterious, tranquil and beautiful, nostalgic and sentimental. Erang is just as wistful here as ever, and confronts the themes with even more openness. That's what I mean by emotionally raw. It's more honest and direct, which can be draining at times, but then tracks such as "Vortex" are a gorgeous break from that reality (as well as yet another variation in style). The compositions can be complex, almost verging on neoclassical territory at times, so this makes for an engaging listen. While it is still, like most dungeon synth, best as a background to mental wanderings, a person focusing more closely on the composition will find a noticeable attention to detail. That said, the album still uses a standard amount of repetition for the genre, guiding the listener into a trance eventually, after he's come to appreciate the beauty of the surface-level details. There's a lot of Burzum influence here (which is never a bad thing, as long as you don't count anything post-Hliðskjálf). It's noticeable on a number of tracks, however it's especially clear in "Forever Lost in an Endless Dream," which seems like a direct nod to "Rundtgåing av den transcendent." These moments are well-done, but are brief and distinct to many of the other styles featured on this record. Despite all the unique details and variations, it still manages to sound very much like an Erang record. While there's nothing wrong with expanding on a vision, I have to say that I don't feel like this record is breaking any new ground that Erang itself hasn't already covered. 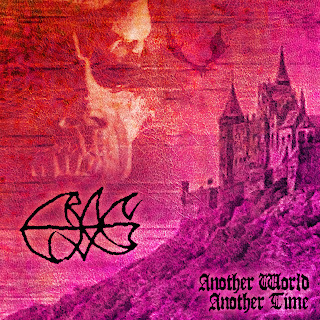 If you didn't enjoy Erang's previous material, I don't think Another World Another Time will change your mind, but it's a solid and arresting gaze deeper within a familiar vision. Definitely worth listening. Also the two ds tracks on Iami's "Luz e Sombra" follow the example of those Burzum tracks closely.